2 comments 3D Printing, Making Stuff! Leave a comment 3D Printing, Making Stuff! In my humble opinion, one of the most useful features of Marlin is the ability to save a bunch of settings to what is essentially a non-volatile area memory that exists on the . . . → Read More: RepRap 101: Activating Marlin’s EEPROM functions, and what that does for you. I’ve set up a Facebook page specific to 3D printing. I think this will make it a lot easier to make small updates that don’t seem to warrant a full blog post. Check it out! Once you’ve got that done, you’re ready to move to the next step, and dial in that calibration just a little bit more finely. 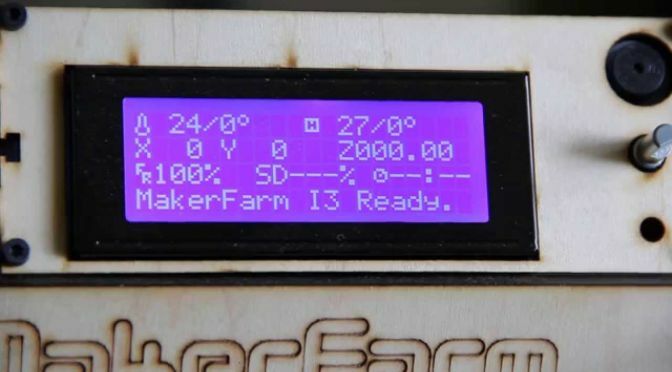 The method I use is a . . . → Read More: RepRap 101: Calibrating your Extruder, Part 2: Fine-Tuning. For the last couple of months, I’ve had the chance to use two different versions of the E3D all-metal hotend on two different printers. I’ve been running an E3Dv5 on my Makerfarm Prusa i3, and an E3Dv4 came with my MendelMax 2.0. They also serve to calm the nerves of those (myself included) who have had the . . . → Read More: 3D printing: some thoughts on all-metal hotends. It may seem obvious; a hotend needs two things to regulate temperature: a heat source to provide the heat, and a temperature sensor to provide feedback as to whether the hotend is too hot, too cool, or in the Goldilocks zone, “Just Right”. The most commonly used temperature sensor is the thermistor, which is a . . . → Read More: RepRap 101: Using silicate-based putty to install a thermistor in a hotend.